Rakusan did not include the Fan Series in his main sequence numbering. Therefore, the original number used for each of the 36 Series prints has been modified to identify the Fan Series members of its theme. The five different fan silhouette shapes have been here assigned arbitrary numbers 1 through 5. To indicate a fan design these shape designations are added to the 36 Series number separated by a hyphen. 136-2 is the Fan Series design with fan shape 2 in the 136 Hollyhock theme. Like all other designs in this series, 136-2 was only produced in a single print run, and few copies are currently documented. The 136 Hollyhock theme is one of the many entirely regular themes represented by a complete fan quintet and a color woodblock print. The Fan Series prints of the 136 Hollyhock theme were distributed in early 1935 in installment twelve (of twelve) and is the last theme of the entire series. The delivery documents for installment twelve remain to be discovered. The series as originally announced would have seen this last installment published in December 1934. However, with documented delays the earliest month it could actually have been delivered is March 1935, and it may well have been even further delayed. Like 136-2 each of the fan designs in this theme has seal C which indicates a carving date during the first half of 1934. 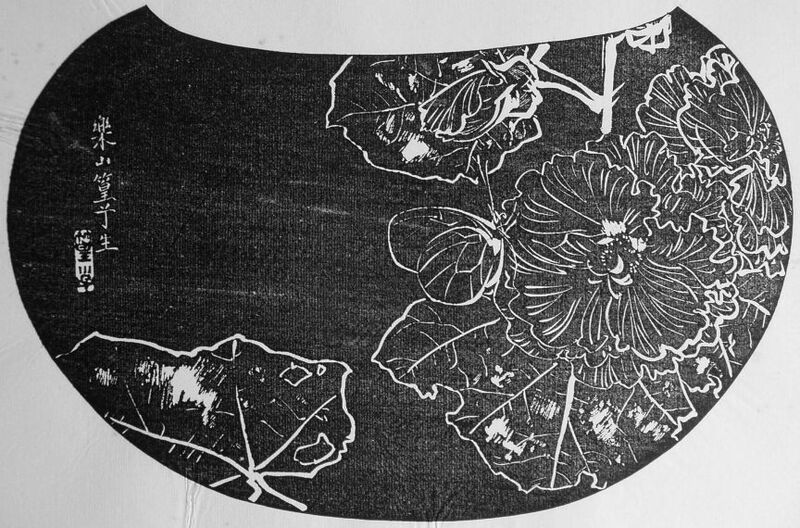 Despite the early completion of its wooden blocks, Rakusan delayed printing and distribution of the prints in what became the 136 Hollyhock theme until the following year. It was eventually grouped with other summer season themes at the end of the series. Use of seal B on the 36 Series design 136 suggests it was carved at least a bit later than the fan prints. At least some of the hollyhock designs in the 136 Hollyhock theme were adapted from among sketches originally created in the late 1920s during the planning of design 13 in the earlier 100 Series (see below). The composition of 136-2 includes a relatively slender hollyhock bloom spike with several associated leaves. In the center a small, solid colored butterfly sits on the edge of a flower. All of the design elements are rendered as simple line drawings which look equally well as ishizuri or reversed. Hollyhock, Alcea (Althaea) rosea, 立(ち)葵, たちあおい, タチアオイ, tachi-aoi, lit. 'erect mallow', is a familiar garden plant in Japan and around the world. Hollyhock was first imported into Japan from China hundreds of years ago, and the plant became important in Japanese cultural life. Many color variations and flower forms have been developed by Japanese breeders. 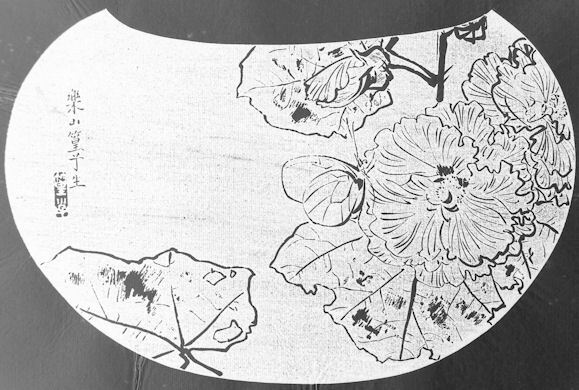 Rakusan used several kinds of hollyhocks in his artworks. The small pale butterfly in 136-2 is certainly a member of the family Pieridae (the white and sulfur butterflies), 白蝶, しろちょう, シロチョウ, shiro-chou, lit. 'white butterfly' (The Japanese collective name includes both the white and the yellow species. However, the yellow species may be called 黄白蝶, きしろちょう, キシロチョウ, ki shiro-chou, lit. 'yellow white-butterfly'.) Rakusan's little butterfly would have been either white or yellow in life, and perhaps is intended as a species in one of the common genera Pieris or Catopsila. Unfortunately determining the original color or species identification from this monochrome design is likely impossible.